Download "Process and Implications of Adjudication through Litigation of CSKT Reserved Water Right Claims vs. Legislative Approval of a Compact"
1 Process and Implications of Adjudication through Litigation of CSKT Reserved Water Right Claims vs. 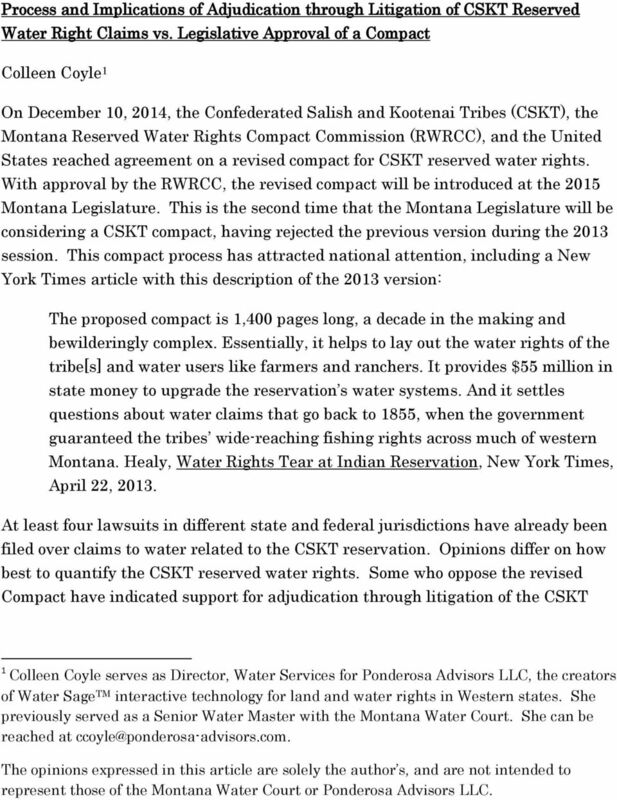 Legislative Approval of a Compact Colleen Coyle 1 On December 10, 2014, the Confederated Salish and Kootenai Tribes (CSKT), the Montana Reserved Water Rights Compact Commission (RWRCC), and the United States reached agreement on a revised compact for CSKT reserved water rights. With approval by the RWRCC, the revised compact will be introduced at the 2015 Montana Legislature. This is the second time that the Montana Legislature will be considering a CSKT compact, having rejected the previous version during the 2013 session. This compact process has attracted national attention, including a New York Times article with this description of the 2013 version: The proposed compact is 1,400 pages long, a decade in the making and bewilderingly complex. Essentially, it helps to lay out the water rights of the tribe[s] and water users like farmers and ranchers. It provides $55 million in state money to upgrade the reservation s water systems. And it settles questions about water claims that go back to 1855, when the government guaranteed the tribes wide-reaching fishing rights across much of western Montana. Healy, Water Rights Tear at Indian Reservation, New York Times, April 22, At least four lawsuits in different state and federal jurisdictions have already been filed over claims to water related to the CSKT reservation. Opinions differ on how best to quantify the CSKT reserved water rights. Some who oppose the revised Compact have indicated support for adjudication through litigation of the CSKT 1 Colleen Coyle serves as Director, Water Services for Ponderosa Advisors LLC, the creators of Water Sage TM interactive technology for land and water rights in Western states. She previously served as a Senior Water Master with the Montana Water Court. She can be reached at The opinions expressed in this article are solely the author s, and are not intended to represent those of the Montana Water Court or Ponderosa Advisors LLC. 2 water rights. 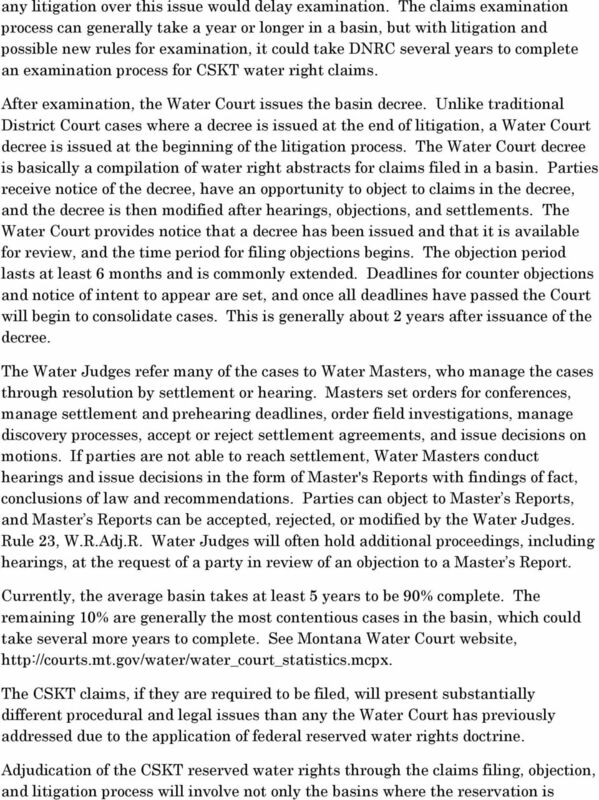 This article summarizes the adjudication process as it generally applies to CSKT and state-based water rights. The United States began litigating Indian water rights for Montana tribes when it filed two lawsuits in 1975 on behalf of the Northern Cheyenne and Crow Tribes and and two lawsuits in 1979 on behalf of the Fort Peck tribes in federal court. 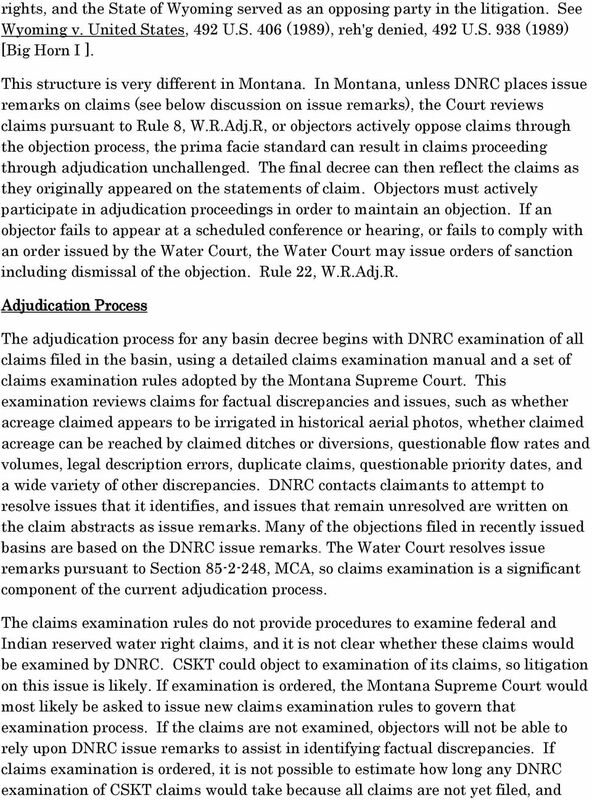 See Folk-Williams, The Use of Negotiated Agreements to Resolve Water Disputes Involving Indian Rights, 28 Nat. Res. J. 63, 82 (1988). In 1979, Congressional hearings recorded widespread concern by non-indians about the consequences of this litigation. Id, citing Senate Select Committee on Indian Affairs, Indian Water Rights in Montana (1979). In 1979, largely because of the federal lawsuits, the Montana Legislature enacted the statewide water rights adjudication effort. In Montana s adjudication process, statements of claim for all state-based water rights (rights other than federal and Indian reserved water rights) were required to be filed by April 30, Late claims were allowed until Late claims are subordinate to reserved water rights and sometimes to timely filed claims. Section , MCA. 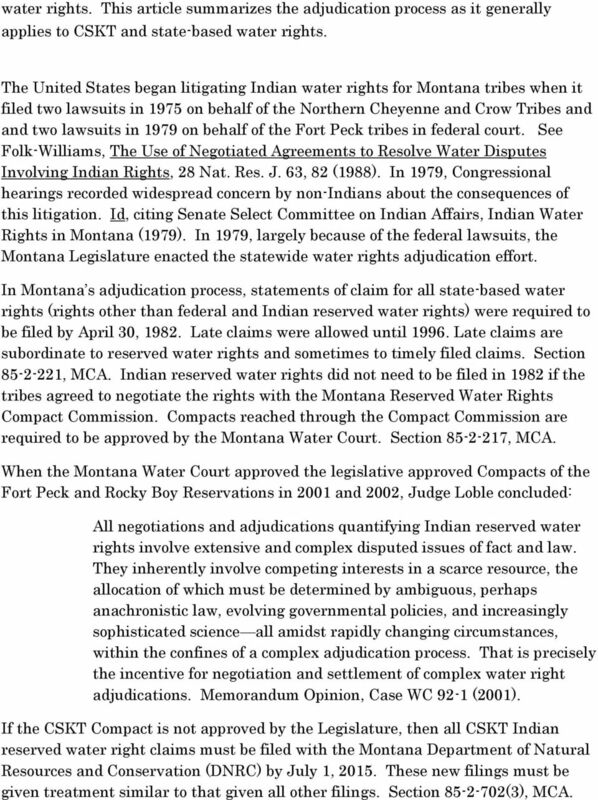 Indian reserved water rights did not need to be filed in 1982 if the tribes agreed to negotiate the rights with the Montana Reserved Water Rights Compact Commission. Compacts reached through the Compact Commission are required to be approved by the Montana Water Court. Section , MCA. 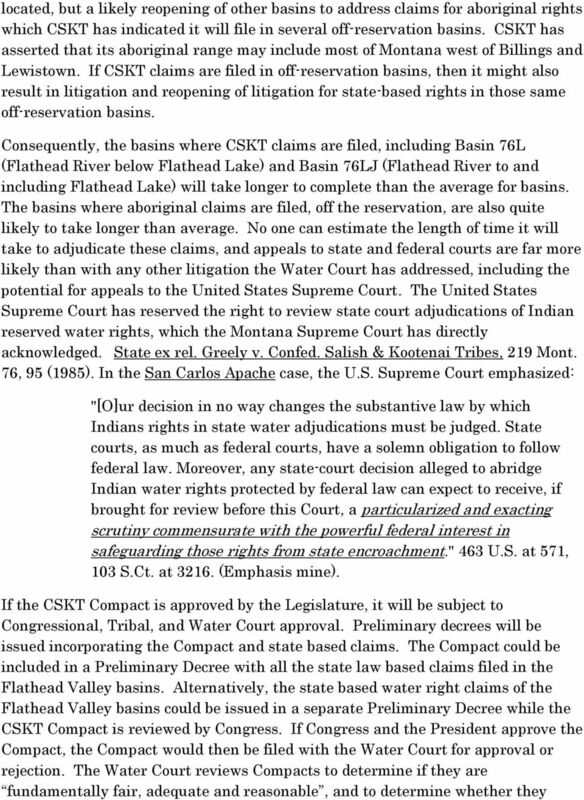 When the Montana Water Court approved the legislative approved Compacts of the Fort Peck and Rocky Boy Reservations in 2001 and 2002, Judge Loble concluded: All negotiations and adjudications quantifying Indian reserved water rights involve extensive and complex disputed issues of fact and law. They inherently involve competing interests in a scarce resource, the allocation of which must be determined by ambiguous, perhaps anachronistic law, evolving governmental policies, and increasingly sophisticated science all amidst rapidly changing circumstances, within the confines of a complex adjudication process. That is precisely the incentive for negotiation and settlement of complex water right adjudications. Memorandum Opinion, Case WC 92-1 (2001). If the CSKT Compact is not approved by the Legislature, then all CSKT Indian reserved water right claims must be filed with the Montana Department of Natural Resources and Conservation (DNRC) by July 1, These new filings must be given treatment similar to that given all other filings. Section (3), MCA. 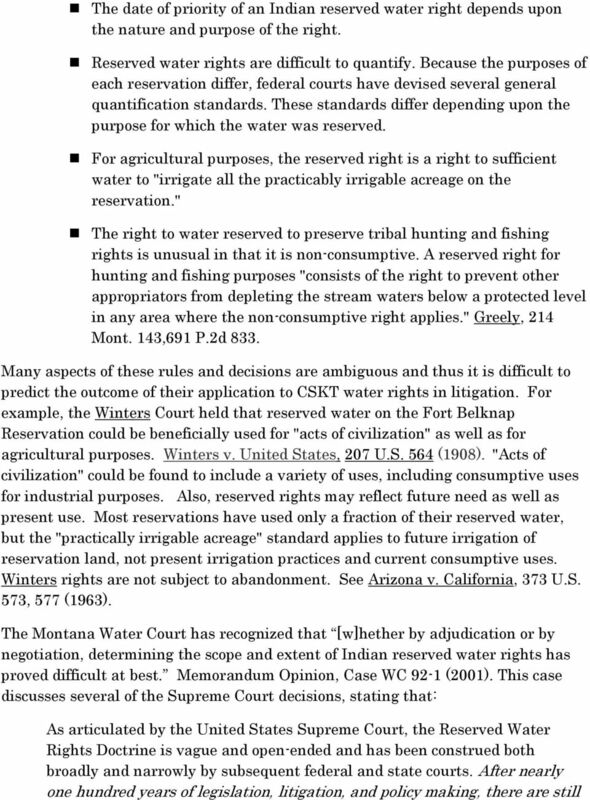 3 Differences between state-based and federal rights for adjudication, and some rules that would apply in adjudication Indian reserved water rights were first recognized by the United States Supreme Court in a case regarding the Fort Belknap Indian Reservation in northern Montana, Winters v. United States, 207 U.S. 564 (1908). Recognizing that the lands were arid, and, without irrigation, were practically valueless, the Court concluded that Congress, by creating the Indian reservation, impliedly reserved not only land, but all of the waters of the Milk River necessary for the purposes for which the reservation was created. 207 U.S. 564, 567 (1908). 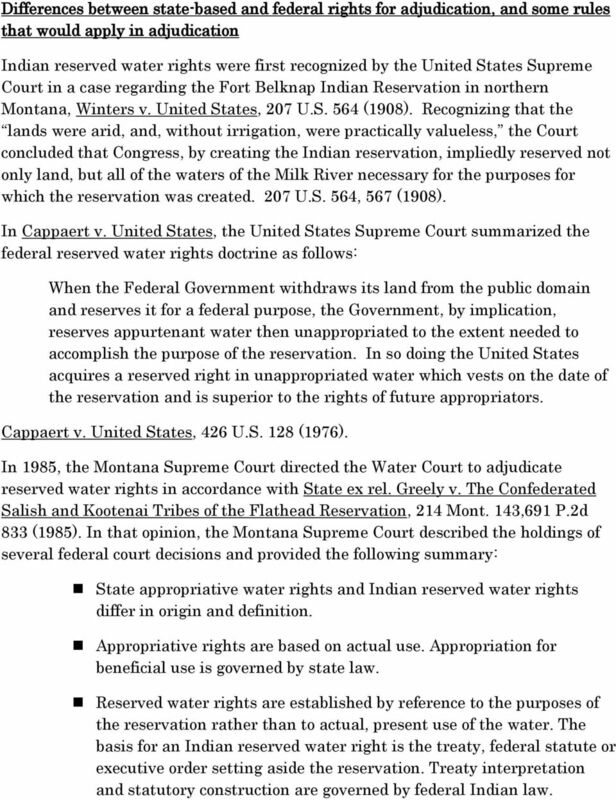 In Cappaert v. United States, the United States Supreme Court summarized the federal reserved water rights doctrine as follows: When the Federal Government withdraws its land from the public domain and reserves it for a federal purpose, the Government, by implication, reserves appurtenant water then unappropriated to the extent needed to accomplish the purpose of the reservation. In so doing the United States acquires a reserved right in unappropriated water which vests on the date of the reservation and is superior to the rights of future appropriators. Cappaert v. United States, 426 U.S. 128 (1976). 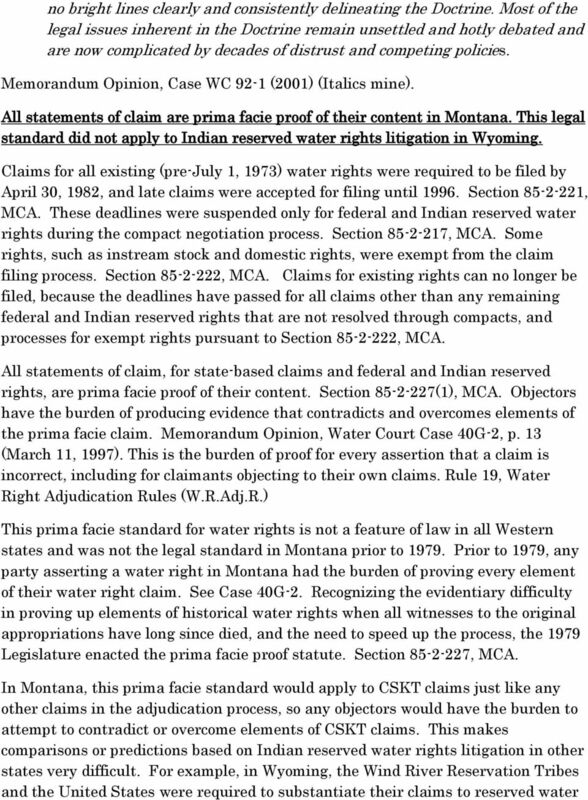 In 1985, the Montana Supreme Court directed the Water Court to adjudicate reserved water rights in accordance with State ex rel. Greely v. The Confederated Salish and Kootenai Tribes of the Flathead Reservation, 214 Mont. 143,691 P.2d 833 (1985). 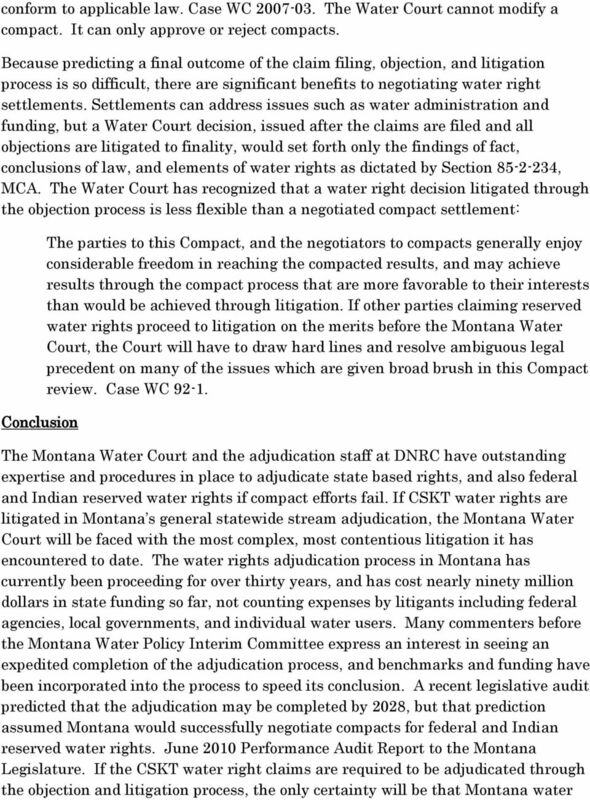 In that opinion, the Montana Supreme Court described the holdings of several federal court decisions and provided the following summary: State appropriative water rights and Indian reserved water rights differ in origin and definition. Appropriative rights are based on actual use. Appropriation for beneficial use is governed by state law. Reserved water rights are established by reference to the purposes of the reservation rather than to actual, present use of the water. The basis for an Indian reserved water right is the treaty, federal statute or executive order setting aside the reservation. Treaty interpretation and statutory construction are governed by federal Indian law. 10 rights will remain unsettled for much longer than any previous estimates could predict. IN THE UNITED STATES BANKRUPTCY COURT FOR THE DISTRICT OF DELAWARE IN RE: Specialty Products Holdings Corp., et al. Bankruptcy No. 10-11780 Debtor(s) 1 Chapter 11 (Jointly Administered) Related to Doc. CHAPTER 13 SCOPE OF NEGOTIATIONS PROCEEDINGS Authority N.J.S.A. 34:13A-5.4d, 34:13A-11 and 34:13A-27. SOURCE AND EFFECTIVE DATE R.2011 d.238, effective August 11, 2011. See: 43 N.J.R. 1189(a), 43 N.J.R. Case 2:10-cv-00802-CW Document 90 Filed 02/02/15 Page 1 of 5 IN THE UNITED STATES DISTRICT COURT DISTRICT OF UTAH, CENTRAL DIVISION MURIELLE MOLIERE, Plaintiff, v. OPTION ONE MORTGAGE, et al., Defendants. 7.3 PREHEARING CONFERENCES AND SETTLEMENT PROCEDURES 7.3.1 Prehearing Conferences A contested case is commenced when the notice of and order for hearing or other authorized pleading is served by the agency. This briefing paper summarizes the measures the Montana Legislature has put into place to improve the state's medical liability climate.